My first ice fishing rod was very basic It was a piece of wood dowel with an ice pick in the end to jab in the ice and two pegs that came out of the side to wrap fishing line on. My first ice fishing rod was very basic. It was a piece of wood dowel with an ice pick in the end to jab in the ice and two pegs that came out of the side to wrap fishing line on. The line was just a braided line with a piece of monofilament line at the last two feet. When you had a bite, you simply pulled the line in hand over hand. Ice tackle today can still be that simple, but there is really some nice tackle out their. The basic ice tackle you need to ice fish is an ice drill or chisel, an ice skimmer, a fishing pole as simple as described above and good ice. Let’s take a closer look at these basics. The first piece of ice tackle you need is some sort of ice drill or chisel unless you think the fish are hitting on the surface! The most basic way to cut the ice is with a chisel. This may work well for opening holes in thinner ice, but an auger or drill is required for thicker ice. If you get a hand auger, keep your blades sharp and you will be able to drill holes with ease. One drawback of the hand auger is in thicker ice, you may be kneeling down on the ice and cranking. If you like to move around or fish a lot, invest in a power auger. There are several major players, Eskimo, Jiffy and Strikemaster just to mention a few. Most of these are gas augers but electric models are also available. Don?t skimp, this is the piece of ice tackle that must operate for you to fish. Second piece of ice tackle on the list is the ice skimmer. The ice skimmer is a must for cleaning the slush out of the hole. This is such a basic piece of ice tackle, but if you don’t have it with, it can be almost impossible to fish. The third piece of ice tackle is the rod and reel. As mentioned earlier, it can be as simple as a rod to hold the line and pull the fish in hand over hand. This actually works well, especially if you are fishing outside and the line is freezing up. As for rods and reels, you can buy all types of rods, some lighter than others depending on what you are fishing for. My brother who is an avid fisherman usually has four or five rods rigged with different lines and hook sizes. Most ice fishing is for pan fish so a light jigging rod with light line is most common, you will need to beef it up for walleye and other game fish. Those are the basic ice tackle requirements. You will definitely want to consider some other items of ice tackle to make your ice fishing experience more fun and productive. An ice shelter is a must piece of ice tackle in cold weather. With just a small heater, you can fish all day in comfort while keeping you equipment from freezing up. Many of these ice shelters are based on a sled design, allowing you to load all your gear in the sled and pull it behind you. Another nice piece of ice tackle to have is a depth finder. Just like in summer fishing, a depth finder will help you fish more efficiently. Many of these units can read through the ice. A GPS is also a nice luxury item, once you find the spot, record the coordinates and hang on to it. If you haven?t been ice fishing before, get yourself some of the basic ice tackle and give it a try. In many areas, you can rent an ice shelter all set up and ready to go with all the ice tackle you need, even pre heated with the holes drilled! 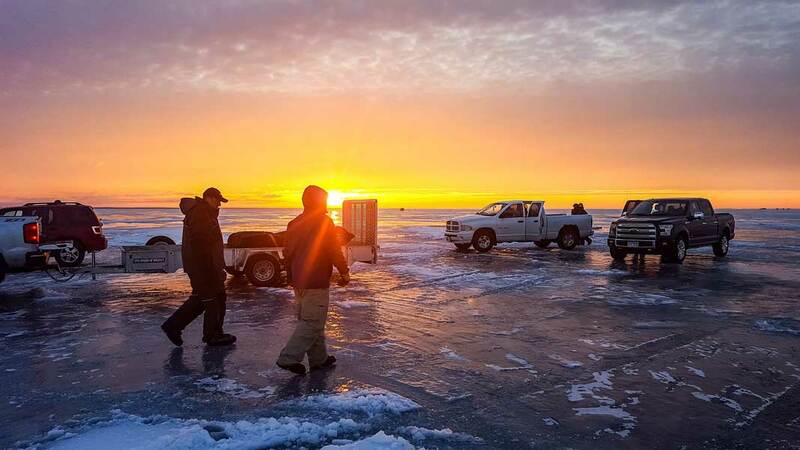 With the right ice tackle, you will love ice fishing.